Who Wants Autonomy in North Iraq? Why Not Reach For the Stars? ARABIC, ARABISM AND THE SYRIAC-SPEAKING CHURCHES IN THE MIDDLE EAST: A HISTORICAL BACKGROUND"
Recent declarations by certain clergymen that the Syriac speaking Christians of the Near East are ethnically Arabs had aroused deep resentments and anger among many Assyrians from all religious denominations, whether members of the Church of the East, Chaldean Catholic Church or Syriac Orthodox Church. The Assyrians were many centuries recognized through their Christian denominations. They were referred to as Suryayeh (singular Suryaya), Jacobites and Nestorians. In the last few centuries members of the last two denominations, i.e. Jacobites and Nestorians, entered into communion with the Vatican and in order to distinguish these newly established congregations they were given the titles Syrian Catholics and Chaldeans respectively. The Assyrians have dwelled in Northern Mesopotamia (Assyria) for approximately five millenniums and established various dynasties and civilization thousands of years before Arabs were introduced to the region as nomads around the northern outskirts of the Arabian Peninsula desert. The Assyrians, as a stateless nation since their empire had fallen in 612 BC, converted to Christianity in the 1st century and continued to speak various dialects of Aramaic, which has a wealth of Assyrian Akkadian loan words in it, to this very day. A very small percentage of Assyrians living in some remote areas remained loyal to their ancient god Ashur (Assur) even into the very early Islamic period as recorded by the Abbasid Caliph while passing through Harran. The Assyrians, as Christians now, had established communities in the Northern Mesopotamian region for nearly 640 years before Islam swept the region. These Christian communities lived as peasant subjects under many powers that invaded the region ever since. They had witnessed repeated waves of persecutions and when fortunate enough to go through few peaceful intervals, they worked hard to preserve their literary language through the churches of their forefathers until today. So, if we know all this from history and I am sure that our clergymen know this very well too through a combination of church records; reliable history books; and archaeological excavations, why do clergymen make declarations contrary to these facts? Why do few clergymen make declarations that they, for example, were Arabs? And does the congregation have the right to ask them not to meddle in the national affairs of the community? And how critical are statements of clergymen regarding this issue in these so dangerous times? In order to analyze this, let us take Syria as a prototype country since many of the latest declarations had come from there and let us try to explain the many questions asked above. We know that the Roman Catholic Church had maintained correspondences with the Orthodox Churches in the Near East after the Crusaders. But with the Protestant Reformation threatening the "true faith" on the European continent, Rome began to expand efforts to convince the hierarchies of the Eastern Orthodox Churches to enter into communion with the Vatican. The Roman Catholic clerics began to pour into the Near East and began to proselytize in the 17th century, but not among Moslems, rather among the already Christian Orthodox! Some claim that while the Crusaders had opened a new wound in the Eastern Christian flesh, the coming of the Latin priests had destroyed the integrity of Eastern Christianity! The mid 19th century sectarian conflicts were not going to stop and no one could guarantee that they were to end in the future, the 1975 Lebanese Civil War was another example. The Christian elite began to articulate a non-sectarian Syrian Arab national identity in order to maintain a political reconciliation among the religious factors. The Christian intellectuals deeply involved themselves in the classical Arabic culture and established links with like-minded Moslems. Together they established the foundation for political ideals known today as "Arabism". Although the trend continued towards Pan-Syrianism with the ideologies of Antun Sa'aada, a Greek Orthodox intellectual who founded the Syrian Social Nationalist Party (SSNP), but the failed attempt to overthrow the Lebanese government and its experience by the SSNP in December 1961 changed completely the party's path. To avoid persecution and isolation, the SSNP stressed that it "agree on clear Pan-Arab objectives." And the Christian elite, especially the Catholics, started this drive towards using the Arabic language in church services and the Orthodox elite ultimately promoted Arabic culture because of the emergence of the sectarian blind loyalties. Few clergymen have claimed in recent years that their Syriac-speaking congregation was an integral part of the Arab population. Some out there today justify those declarations by stating that such clergy were anticipating this phenomenon known today as the "clash of civilization" as those intellectuals had in the past. The Patriarchal magazine indicated that Patriarch Zakka I Iwas, for example, had said in speech on January 24, 2000 in Damascus: "
" The speech was printed in the Patriarchal Magazine. Others have claimed that Patriarch Raphael BiDawid of the Chaldean Catholic Church, while he was a Bishop of Lebanon, had made remarks that his congregation was ethnically Arab. Although the Chaldean Patriarch declared differently in other occasions and most remembered has been his interview on the LBC international TV station where he declared that Chaldean is a religious sect and that Chaldeans were in fact Assyrians. Other clergymen in Iraq when interviewed are forced to claim things in parallel to such. ). Sabro magazine showed that in a letter by Archbishop Clemis Eugene Kaplan, Archbishop of the Western United States Archdiocese, sent as an insert inside the Sabro magazine in which he claimed that he and his community were Syrian/Arab Orthodox Christians. Kaplan was originally born in Northeast Syria, but his family was originally from the city of Azakh/Beth Zabday in Southeast Turkey. Molphono Gabriel Afram and Qolo Radio Station in Sweden had an interview with Bishop George Saliba, in around November 18, 2001, the Syraic Orthodox Church bishop in Lebanon, to clear the latter's statement with Ozgur Politika (the Turkish newspaper of the PKK) where the bishop was quoted stating that we were Arabs. The bishop very clearly claimed that the Christians who came from Turkey were Turkish and those from Syria and Iraq were Arabs. These declarations are not out of the ordinary when the Christians of Syria have taken this path much earlier. Many of these clergy reside in the Middle East or are in the west but are under Patriarchs who reside in the Middle East and they are under the authority of the Arab Governments. Many believe that these clergymen have no option but to say so in these very dangerous times that add to the problem created earlier. Should Assyrians in the west protest such declarations? I say, absolutely. Let the Arab governments understand that the Syriac Speaking Christian congregation in the west will not tolerate the Arabization process that has been followed by those governments since those Arab states were established in early and mid 20th century. And if Christians in Syria and Lebanon had in the past taken steps towards diffusing tensions between Moslems and Christians during the Arab Renaissance by promoting the Arab culture, that should not mean under any manner that these communities are ethnically Arabs. At the same time we must understand the position the clergy they are in. Many say that under any democratic and normal circumstances these clergymen would never make such declarations. But there is another opinion out there that disagree with the above and demand that clergymen should stand their ground and be proud of who they are even if that results in their personal persecution since they have devoted their lives to serve their people, the truth, and the word of God. These latter voices see such clergymen as weak and unworthy of the position they are occupying. They assert that clergymen must reflect the voice of the congregation and not their own and since the various Syriac-speaking congregations in general do not see themselves as Arab, clergymen should not make such declarations accordingly, and one must admit that these people have a valid point too. Daniel Pipes, "Greater Syria: The History of an Ambition", 1999, p. 36. Daniel Pipes, "Greater Syria: The History of an Ambition", 1999, p. 50. Patriarchal Magazine. Issues 191-193 / January-February-March 2000. Vol. 38. Sabro magazine. Vol. 3, July, August, September 2001, Issue 10. In the beginning of the seventies, in Midyat, a Christian town and centre in the ancient region Turabdin, was besieged and under armed attacks during three weeks by the Turkish military. Harassments in general, and mob-attacks with sweeping motives, such as guilty by association to the Christians in the civil war of Lebanon, constituted part of the daily life in Turabdin. Because of the ethnic mobbing operations thousands of Christians escaped to different countries in Europe since 1975. The properties of Assyrians/Syriacs were confiscated or occupied by persons who supported the regime in power. After the coup d'état in 1980 a new constitution was introduced in Turkey. According to Article 24 in the constitution every citizen of compulsory school age had to attend to the Islamic religion classes. In schools the Christian children were harassed and persecuted in a barbarian manner. v) to become a pilgrim in Mecca. The children were to confess "A'mentu", the confession of Islam. These types of operations were implemented not only in the countryside but all over Turkey. Testimonies of abuses of this kind are available from e.g. government schools situated in the heart of the capital, Ankara. The children who did not learn to pray as a Muslim and who did not surrender completely, were forced to wear hats with motives of devils and with horns. The hats displayed personal humiliations like "I obeyed the devil and not Allah". The children were forced to go from classroom to classroom in order to be humiliated by their schoolmates. Both girls and boys received this punishment. Other forms of punishment were to put these children, the children of "gavur" (heretic and non-believers), in special classes designated for children who were considered handicapped and "slow thinkers". Some of these "slow thinking" children are today, after their escape to Europe, engineers and professors with international distinctions and awards. Today many of these people still suffer from their traumatic childhood. when it had a legal basis, but it was a continuation of an ongoing tradition of the persecution of Christians since decades. It does not make a difference to its victims if a human rights abuse is legal or illegal given that the government tolerates it. Assyrians/Syriacs attempted at every possible instance to be liberated from their obligation to send their children to Islamic "religion classes", but with no success. Assyrians/Syriacs are both ethnically and religiously different from the majority of Turkey's population. They immigrated in masses to Europe in the eighties since it was impossible to survive as Christians in an Islamic and nationalistic environment. The campaigns, whether official or unofficial, were realized under the tolerance or protection of the Turkish government, which was marketing itself to western countries as "secular". Yet, Turkey is a member of the European Council and NATO, although Christian children are still forced to attend classes maintaining and spreading Islamic faith, without instruction in their own Christian faith. The country has signed many conventions on human rights. It has specially favourable trade conventions with the EU, and is even aspiring full membership in the EU. "Mulla" Zubeyr and "mulla" Abdulgafur Gündüz publicly, and with full impunity, called on Muslims in their preaching's not to have any contact with Christians, including trade contacts, as an extension of the tradition not to eat meat slaughtered by Christians. According to them, Christians who are "not purified" and "non-believers" do not deserve a human treatment. The Islamic fundamentalists and the Turkish army collaborated against the Christians. Many Assyrians/Syriacs were murdered openly without any attempt to catch the persons who committed the crimes. The Syriac Yakup Görgün (Zgayre) was murdered in 1990 openly in Midyat. His wife Cheno identified all of the murderers, but all of these criminals were set free the day after their arrest. Cheno went to the lawyer Hasip Kaplan in order to receive help in bringing the case to the court since the prosecutor was not interested in fulfilling his obligations. By means of forensic medicine it was proven that Yakup was shot by a G-3-weapon, a type of weapon used only by the Turkish army. It was obvious that the murderers were militaries and Islamic fundamentalists, since the state was not interested in justice despite lawyer Kaplan's attempts. The properties and the farms of the Christians have been plundered systematically by the Islamic fundamentalists, with the army's full awareness. Many Christians were kidnapped and regained their freedom only if they could pay large sums of money. Systematic persecutions are still a part of the daily lives of Assyrians/Syriacs in Turkey. Still the properties of many Assyrians/Syriacs are occupied. The courts dismiss the cases of those trying to establish justice by legal means, with further retaliations waiting if they should continue their attempts. Consequently, today there are only about 2000 Assyrian/Syriac inhabitants left in Turabdin. Assyrians/Syriacs have, since thousands of years, significantly contributed to human civilization. But in their homeland Turabdin, their number is in steep decline towards zero. (ZNDA: Baghdad) raqi police went to Mohammed Osman's home in Kirkuk, northern Iraq, in May 1996, and gave him a choice: Renounce his Kurdish ethnicity or leave town. Mr. Osman, who in the past managed to buy time with a $60 bribe, could not afford it anymore and chose to leave. Mr. Osman came to this refugee camp, where 100 families from Kirkuk have fled what they call the "Arabization" of the city. They are among tens of thousands of Assyrians, Kurds, & Turkomans who have had to leave Kirkuk for one reason: They aren't Arabs. Kirkuk is a center of oil and agriculture and is of prime strategic importance for northern Iraq. Since the founding of the Iraqi state after World War I, Arab-controlled governments in Baghdad have been expelling non-Arabs in an effort to solidify control, say non-Arabs and international human rights groups. In 1999, the government introduced a new policy of "nationality correction," under which non-Arabs are asked to change their ethnicity on identity cards and census documents or leave. Mr. Osman said he knows of only a handful of people in Kirkuk who have accepted the offer. "We are Kurds. We refuse to be Arabs," he said. Those who do change their ethnicity still face discrimination. They are not allowed to hold top jobs in the government or oil industry and may have to adopt Arabic names. In a perverse twist, some are punished for having "incorrectly" declared their Kurdishness in the first place, according to some Kurds who have left the area. In Kirkuk, there is no education in Kurdish or Syriac languages, and the only media source in Kurdish is a two-hour daily television program of propaganda from Saddam Hussein's Ba'ath party. The government forbids non-Arabs to own homes, cars, or marry Arab girls. For an Assyrian to own a car, he must first become an Arab. "As long as the Ba'ath party is in power in Baghdad, I don't want to go back [to Kirkuk]," Mr. Osman said. Since 1991, the three northernmost Iraqi provinces have been administered by the Kurdistan Regional Government, protected from Saddam Hussein's rule by U.S. and British enforcement of a no-fly zone. Two more largely Kurdish provinces are still controlled by Baghdad, including the province of Kirkuk. The Erbil-based Committee for Confronting Arabization in northern Iraq estimates that since the 1960s, 190,000 people have been expelled from Kirkuk province into Dohuk and Erbil provinces in the no-fly zone. The committee is preparing a census to get more accurate numbers on the people affected by Arabization. Its people hate Saddam Hussein, its government is pro-Western and its soldiers battle-hardened and familiar with the terrain. So it would seem that in North Iraq, the Kurdish-controlled entity in northern Bet-Nahrain, would be a natural ally in an expected U.S. attack against Iraq. Not so fast, say officials and ordinary people here. In the 10 years since North Iraq has been sheltered from Baghdad's control by an Anglo-U.S. no-fly zone, it has provided its mostly Assyrian, Kurdish, and Turkoman population with a life relatively free of the hardships and restrictions most Iraqis face. There are freedoms of speech and education in local languages, Internet and cell phones in the big cities, and better economic opportunities. Government officials say they want to make sure any action they participate in will maintain this situation. "We are not going to be the initiator of any military action," said Sami Abdul-Rahman, a deputy prime minister of the Kurdistan Regional Government. "But if a military conflict takes place, we'll behave in the best interests of the Kurdish people and Iraqi people." Specifically, Kurds want to make sure that Saddam's successors don't end Northern Bet-Nahrain's autonomy. "The status quo is the best thing our people have had in their recent history, and it would be good if it continued," said Mr. Abdul-Rahman. "We hope that such a successful experiment will not be strangled." After the 1991 Persian Gulf war, an uprising by Kurds in northern Iraq was repressed by Baghdad, prompting the United States and Britain to impose the no-fly zone protecting three Kurdish provinces. Two other provinces, Mosul and Kirkuk, are still under Baghdad's control but are considered by Kurds to be part of North Iraq. In their protected enclave, Kurds established a parliament and government structures. Five seats in the "Kurdish" parliament are allocated to the Assyrians. Infighting between the rival Kurdistan Democratic Party and Patriotic Union of Kurdistan in the 1990s left about 1,000 dead. But a deal in 1998 ended that conflict, and the two now share power, the KDP controlling two provinces and the PUK the third. Many believe that the KDP and PUK are leery of war because they want to protect their fiefdoms. Concern that northern Bet-Nahrain's autonomy might be threatened or that Saddam might pre-empt or retaliate against a U.S. attack by moving into North Iraq are overstated, said Yonadam Y. Kanna, General Secretary of the Assyrian Democratic Movement and a member of the Kurdish enclave's parliament. "That's politicians saying that, not people. [They] want a guarantee from the West that they'll have some autonomy [in a post- Saddam Iraq]," Mr. Kanna said. PUK and KDP leaders have recently met American officials in Berlin and in Virginia, where they discussed the Kurdish position on a U.S. attack. Concerns about war appear to be less based on issues of autonomy than on instability in general, as well as worries that any action might be based more on U.S. interests than on those of Kurds or Iraqis. Although people here hate Saddam Hussein - he destroyed 4,500 Kurdish villages in the 1980s, attacking some with chemical weapons after they had been overrun by Iranian forces in the eight-year Iran- Iraq war - Kurds have no problem with Arabs. There is a small indigenous Arab population, and in the last 10 years many Arabs have come to North Iraq for better job opportunities. Most people are not interested in north Iraq becoming an independent country, but rather staying part of Iraq and controlling their own affairs. "We can't live alone. We don't want the U.S. to bomb Iraq, because we're part of Iraq and we don't want the Iraqi people to suffer," said Jamal, a retired bazaar salesman in Erbil. There is also a lingering mistrust of the United States because it encouraged and then abandoned the uprising in 1991, and then failed to back another in 1996. "If nothing like in '91 or '96 happens, then we'll help [a U.S. attack]," Jamal said. "But if it's like then, we don't want to have the U.S. anywhere near here"
There are many reasons why the Assyrian language and culture have survived so long. Geographic isolation is one of them. I had always thought that this protective shield of geographic isolation had ended in this era of modernity. I was wrong. Nahla, the name of a region 2 hours north of Aqra, is a collection of eight villages very much living in the past. Until now that is. 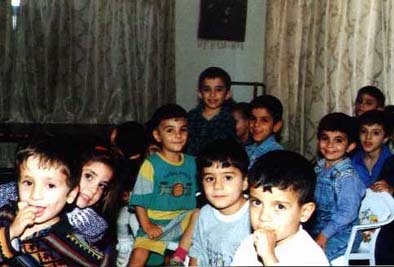 The Assyrian American National Federation (AANF), under the aegis of the Assyrian Aid Society-Iraq (AAS-I), has seen to it that this area finally entered the 21st Century on the 19th May 20002. As unbelievable as it may seem, the entire Nahla region has had no electricity since Assyrians were first settled there by the British from the Mindan refugee camp near Mosul1 in 1927. The nights are lit up by kerosene lamps. Water is heated by campfires. There are no electrical appliances to convert yoghurt into butter and dawweh (watery yoghurt drink) - goudhe (sheep skin sacks) are still used. There are no TVs, fridges or air-conditioners. True to their mission of keeping Assyrians in their lands, the AAS-I and the AANF have brought electricity in the form of 5 kerosene generators and 2 water-powered generators to the Nahla villages of Kashkawa, Joule, Khalilane, Hizane and Belmende. (The water generators are to be instilled in Miruke and Cham-Rabatke at a later date). A large hired truck fitted with a crane brought the five 600kg generators to the meeting point, where asphalt roads give way to the dirt roads leading to Nahla. Two four-wheel drive vehicles led the way and ours followed behind. Massive pot-holes covered the road, making for a very rough ride. Things gradually got even rougher as we neared the first, southern-most village of our trip, Kashkawa. The truck-driver eventually stopped and gave up the sheer inclines and bumpy roads made travelling further impossible. He pointed out in Kurdish that the belly of his truck was being ripped up by the road. I then realised what the villagers needed next after electricity - new roads. And I was later told that the roads were actually good this time of the year - come winter, forget about using the roads altogether, they said; villagers have to cut through neighbouring mountains by foot to get to town. So the four-wheel drives set off for the village while the hired truck stayed behind, waiting for tractors to come back and fetch the generators. It was a good thing too. The roads got even rougher (if that was at all possible). We crossed a shallow creek and finally Kashkawa came into view. And it was all worth it. I felt as if I had stepped into an Assyrian village the way it was a thousand or more years ago. Those present for the historic event were members of the AAS-I and AAS-Australia, Sheba Mando, President of the Assyrian National Council (ANC) of Illinois, Aprim Rasho (Vice-Chairman of ANC) and representatives of the Assyrian Democratic Movement (ADM). We were warmly greeted by the villagers, renowned for their kind spirit and friendliness. Brothers Qaiser and Giwargis Daryawoosh were among those eager to show me around Kashkawa, which I found surprisingly clean and orderly for a village so isolated. Proves you don't need to be near civilisation to be civilised. (Sometimes I think the opposite is more true). There were plenty of sheep, goats and stunning looking horses. In fact, Nahla is known to be the richest in the Middle East for grazing animals the grass is greener for longer periods and when it dries out there are trees in the mountains whose leaves are edible to sheep. A river, the Ghazer, cuts Kashkawa off from the neighbouring village of Joule. A channel runs parallel to the river, the Kashkawa channel. Built in 1927 by spades and 7km long, it runs from a distant Kurdish village of Galidupere (from the Kurdish for gali valley, du two, pere bridges) all the way to mountains several kilometres away. Every year for twenty days, Giwargis said, the 7kms of channel are dug by spades! It's a back breaking job, I realised Nahla's second need - concrete channels. We passed some abandoned houses. In a place as beautiful as this, they were a somewhat depressing sight. Qaiser explained that these families had left for Aqra for their children's sake; there are no schools in Nahla. Having witnessed first hand the roads leaving Nahla, travel to schools outside the region is clearly not an option. But leaving the village for this reason will stop very soon. The AAS has taken care of business and built an all-Syriac school in the very close-by village of Hizane, due to be opened later this year. The sun was beating heavily on Kashkawa. It must have been at least 300C at midday. The young Yonadam Moushe, a Kashkawan and student of Nissibin School invited me for a dip in the Ghazer River. I couldn't resist. Besides, I promised I'd go for a swim in the Tiglat River, but I didn't count on it being so heavily guarded near the Syrian border. The Ghazer is no Tiglat but at least I'd be swimming in ancient Assyrian water, I thought. I wasn't disappointed. The water was crystal clear and as cool as ice water. It clearly comes from mountain snow beyond Galidupere. After drying off and getting dressed, Younadam pointed to some hills about 700 metres away. "See those hills, where there's a bunch of trees?". My grandfather was martyred there in 1969. He was killed by Arab forces in the 1969 conflict between Kurds and Saddam's regime. Seven others were martyred too. All 8 villages were then burnt and napalmed and bombed. The villagers' resilience staggered me. This was certainly not the first such attack. Kashkawa has been devastated an incredible five times in 1964, 1966, 1968, 1969 and 1987. Each time Kashkawa was burnt, the villagers would move to the neighbouring inaccessible mountains. "We would stay in those mountains," Giwargis Yacoub said, pointing, "and wouldn't come down until the army left before the bitter winter. If someone did come down, they would be shot at by Saddam's army posted on the mountains opposite." The second last time the village was destroyed in 1969, the villagers returned in 1972 and there was relative peace until 1987 when the army once again came back and did its heinous acts. "We have seen nothing but wars.. we are tired and don't believe anything we hear about regime change and so on.. we've heard everything!" Giwargis Yacoub said. It's a testimony to the villagers' strength and resilience that they haven't lost all hope and left their villages for good. The current houses were built by Caritas (a charity organisation). The roofs and walls are made of mud and need to be scraped of snow in winter or else water seeps through and makes life awfully uncomfortable. The other need of the villages was obvious - concrete roofs. Zaya Giwargis Isho, Kashkawa's mukhtar (village chief) summarised his village's needs. "Our church was burnt in 1987.. we need another one built. Decent streets, a hospital and concrete channels are other top priorities." The ever-present and hard-working team of Ashur TV, cameraman Sawra Enwiya and reporter Malko Khoshaba, recorded the event. Odisho Patros Odisho and Rosa Kourish Baytoon both said "Thank you very much AANF, AAS and ADM! We were living in the dark before. Now we can watch TV and know what's happening in the world... This is our fathers' and forefathers' land. We will never leave!" The tractors eventually came after a few hours with their prized cargo. As no heavy equipment could make it past the rough roads, the task of lowering the machines into place was left to a dozen of the village's men. Six-hundred kilograms is a lot of generator, and they managed to lower them each time without event. From Kashkawa we moved to Joule, a lovely village under a kilometre away. It sits on top of a hill and commands views over Kashkawa. We moved to each village in turn and ended up in Belmende that evening. We stopped there for the night. Our host was Yosip Khobiar. Kerosene lamps came out, a campfire was lit and our bath water slowly heated. After a hot bath by the light of a kerosene lamp, we had dinner - a simple fare of lamb ('sacrificed' earlier that evening), rice grown by the villagers in Nahla and local whiskey. After warming up a bit, the compulsory Assyrian singing broke out. Only this was a little different from the usual songs. Raweh is an ancient form of Assyrian chant that I can best describe as a cross between Red Indian tribal singing and . We slept well that evening, exhausted by the travel and hauling of generators. Even the pervasive smell of kerosene wasn' enough to wake us up. Breakfast was prepared early the next day -- eggs (Nahla's eggs give "free range" a new meaning), fried in butter freshly prepared in a goudha, cheese, yoghurt and bread. I felt privileged and lucky to have experienced this traditional way of life prior to the villages' historic electrification. The geographic isolation which has been a protective force and a bug-bear for Nahla is finally coming to an end. I'm sure things will look a lot different the next time I come back to Nahla. 1-50,000 Assyrians from Hakkiari (out of the original population of 200,000) fled their original lands in the summer of 1915, never to return. They were temporarily resettled among the Assyrians in the Urmia region until 1918 when, after their artillery was depleted and military aid from the Allies stopped, they once again fleed to Baquba in August 1918. From there those who chose to stay in Iraq rather than return to Iran were relocated to the Mindan refugee camp in 1921. They were finally broken up among the villages of North Iraq. Those from Upper Tiari ended up in their current home, Nahla. (ZNDA: London) According to a report in al-Zaman Newspaper published in London on 26 June, the Assyrian Ethnic Conference [AEC] has announced that it has established an alliance with the Free Officers Movement. The statement sent to al-Zaman was signed by the AEC leader, Mr. Sargon Dadesho. The statement said that discussions took place between the Free Officers Movement and the AEC, which also includes the Assyrian American Leadership Council, Bet-Nahrian Democratic Party, and other Assyrian organizations. These discussions were crowned with the two sides agreeing to establish a mutual alliance and to cooperate. The agreement was signed on behalf of the Free Officers Movement and its Secretary General [former] Staff Brig-Gen Najib al-Salihi. its new alliance in Britain of the Iraqi Communist Party [ICP], Al-Da'wah Party and the Arab Socialist Ba'th Party - Iraq Command. The main goal of the coalition is overthrowing the regime of Saddam Hussain at the hand of the Iraqis without outside intervention. Mr. Sargon Dadesho's "Assyrian Ethnic Coaltion" is among the groups joining in the Iraqi National Forces Coalition. Others include ICP, Islamic Al-Da'wah Party, Arab Socialist Ba'th Party - Iraq Command, Group of Mujahidin Ulema in Iraq, Islamic Action Party, Iraqi Democratic Grouping, the Kurdistan Communist Party, the Socialist Party in Iraq, the Turkomen Democratic Party, the Arab Socialist Movement, and the Islamic Union for Iraq's Turkomen. While Al-Da'wah Party announced its determination not to exclude any effective force in the Iraqi opposition to the extent that it made the formula of the coalition flexible enough in order to allow room for other opposition parties to join in on the condition of adhering to the firm [national] stands, the ICP, meanwhile, expressed its hope that the coalition would help in facilitating a positive atmosphere that would speed up the establishment of the aspired for comprehensive national alliance of the Iraqi opposition, stressing that the coalition is not being established with the aim of entering into confrontations with other plans or frameworks. The `political commission' of the `coalition' is expected to hold an emergency meeting in a couple of days during which a communique that contains the charter and the goals will be announced. An informed source said that the coalition came as a result of intensive efforts made over several months during which many experiences were examined with the aim of making the opposition's actions more effective in order to reach its goals. The source added that the coalition would be comprised of a `general council' that would include parties, organizations, Islamic, nationalistic and democratic tendencies, as well as independent figures and a 'political commission' that would act as an executive committee. The 'political commission' held its first meeting the day before yesterday during which the participants discussed the general goals of the alliance and 'the national action charter', which contains the bases and firm stands that were agreed upon as well as the draft final statement regarding the formation of committees. - Stressing the central goal of the opposition, that is overthrowing the regime. - The process of overthrowing the regime should be the mission of Iraqis themselves and stems from an independent will. - Maintaining Iraq's sovereignty and its unity as a territory and people. - Rejecting foreign interference that targets the Iraqi people and their vital interests as well as military aggression and international siege. - Working to establish a free Iraq that would guarantee a democratic process and a peaceful rotation of power through elections. - Banning discrimination based on sectarian, ethnic, and political grounds and respect must be established for the right of citizenship and human rights. - Respecting the various ethnic, religious, sectarian, political and ideological backgrounds. - Solving the ethnic issue in Iraq fairly and peacefully in order to guarantee the legitimate rights of the Kurdish people and other ethnic groups. - Emphasizing that Iraq should play a positive role regionally and internationally so as to ensure stability and cooperation among the regions' countries and their peoples and to dismantle all the consequences of tension, wars, and mistrust created by Saddam's regime. - Attracting opposition forces inside Iraq including civilians and the military. - Facilitating the requirements to provide backing for field action inside Iraq. (ZNDA: Tehran) Earlier this week, Mr. Yonatan Bet-Kolia, the representative of the Assyrians in Iran's Majlis (Parliament) offered a message to President Mohammad Khatami of Iran, expressing heartfelt sympathy for families of the victims of the quake which rocked the cities of Qazvin and Hamedan on Saturday. The earthquake killed 245 people and left thousands homeless. The quake's magnitude was registered at 6.1. President Khatami, this week, said that his government will accept U.S. aid to help it recover from the devastation. (ZNDA: Washington} Americans of Iraqi descent hosted a conference in Southfield, Michigan on June 1, on the topic of Iraq's future. At the "Iraqi American Conference for a Free and Democratic Iraq," Iraqi-Americans called on the U.S. government and policy makers, and the American people and institutions to support the Iraqi people in their quest for a free, just and democratic Iraq. "As Iraqi-Americans we ask our government to use its influence and power to bring change in Iraq toward democracy, respect for human rights and a new constitutional regime," said Nouri Sitto, conference co-chairman and coordinator of the Iraqi Democratic Union (IDU) of America. The conference was co-organized by the IDU and the Iraqi Forum for Democracy (IFD). The IDU was established 20 years ago to work on enhancing the status of the Iraqi-American community in the United States and to assert its identity and links with Iraq; the IFD, a non-profit political action group, was established in 1998 to lobby policy makers and political organizations around the world to work towards a pluralistic democracy in Iraq. Sponsored by 20 organizations that represent a wide spectrum of the Iraqi-American community, the conference hosted more than 300 participants representing the many ethnic and religious affiliations of Iraqis living in the United States, including Assyrians and Chaldeans (1), Kurds, Mandaeans, Shi'a and Sunni Arabs, and Turkmen. The conference organizers emphasized that regime change in Iraq is not enough; they said the discourse on the future of Iraq should include discussion of democracy. "We want the current policy of changing the regime in Iraq to be coupled with establishing democracy in Iraq. It is very important for Iraqi-Americans to see the two coupled in the official policy of the United States," said Emad Dhia, conference co-chairman and president of the Iraqi Forum for Democracy. The conference featured speakers from the State Department as well as from the Iraqi Diaspora in the United States and Europe. finance, media outreach, water, agriculture and the environment in a future Iraq. "The role of the U.S. government and State Department is to see what the Iraqis and Iraqi-Americans want," Warrick said. "The impetus for change comes from you not us. This is the job of Iraqis inside and outside." Thomas Krajeski, deputy director at the Bureau of Near East Affairs at the State Department, congratulated the organizers on the success of the conference, and said that the State Department supports the efforts of the Iraqi-American community. "I am impressed with the number of organizations and your involvement in the discourse; we share with you and other Iraqis the vision and goal of an open and free Iraq that respects the rules of justice, rule of law and rights for all its citizens," said Krajeski. Speakers at the conference discussed a range of different governing models for a future Iraq. All agreed that a future government in Iraq must be based on an equalitarian constitutional democracy that is decentralized and representative of all ethnic and religious backgrounds. "Iraq has a plural society, of people, languages and religions. Although we have diversity, we have one thing in common -- the love of our country," said Abdul Hussain Raoof, professor of Political Science at SUNY College of Buffalo, New York. To avoid divisions along ethnic and religious lines, Raoof urged those present to steer away from "nationalism" as a political movement. "We need to keep this division in mind while thinking about a political model. There should be no talk about Arab nationalism and Kurdish nationalism," he said. Feisal Amin Al-Istrabadi, a trial lawyer in the Chicago area and a founding member of IFD, reiterated this point when he said, "we need to build a cohesive country and not continue along ethnic divides." Isam Al-Khafaji (2), a professor of nation formation and development at the University of Amsterdam, brought up possible obstacles that Iraq would face during its quest for democracy. According to Al-Khafaji, the discussion of the future of Iraq cannot neglect the regional context in which Iraq exists. "With a weaker Iraq, the impact of the surrounding countries on Iraq in the foreseeable future will be greater than Iraq's impact on them," he said (3). "Let us think realistically," Al-Khafaji added. "The message is not to back away from the search of a peaceful Iraq, but to think about the actual realities." Looking to build a democratic Iraq, conference participants also discussed the importance of building alliances with as many groups as possible in the international community. order to preserve the country's hydrological system. In constructing a vision of a future Iraq, participants generally agreed that the Iraqi people should be the final decision makers. "We should look within to bring about change," said Laith Kubba, senior program officer for the Middle East and North Africa at the National Endowment of Democracy. Wadood Hamed, a writer and activist, and a senior research scientist, agreed. "Enduring democracy has to come from within," he said. must be dismissed from any political role in a future Iraq. Many at the conference considered a federal system to be a useful model for future governance in Iraq. Federalism, according to Kanan Makiya, a professor at Brandeis University, devolves power away from the center. "The first step is to move towards a new state system where there is no majority rule; where the rights of minorities are protected and guaranteed," Makiya said. He urged that the new Iraq would not only be demilitarized through constitutional limitations on military expenditures, but also through a formal process of renunciation of war as an option to solve problems in the international arena. individuals as well as groups. He said segmental democracy is based on three principles: 1) recognizing the autonomy of each segment and group of the population, which have the right to manage their own affairs and the power to influence the decision making process; 2) allowing for proportionality of segments in every institution of government, including the cabinet, civil service and the military; and 3) granting autonomy to each segment of the population without interference from the central government. If segmental democracy were to be established in Iraq, Raoof said, a coalition of leadership between all parties would be formed. The "National Unification Council," as he referred to it, would represent all segments of society and all groups. Conference participants concluded that the real issue ahead of the Iraqis and the Iraqi-American community is to follow up on proposed talks and plans. "There must be initiatives. Mobilize the ethnic communities, while looking for support in the international community. There needs to be reestablishment of civic groups and institutions. We must encourage Iraqi-Americans to be active in civic groups," said Kubba. Conference organizers estimated there are some 170,000 Iraqi-Americans living in southeastern Michigan. This conference, they said, marked the first time that a wide range of Iraqi-Americans has come together to work towards a common goal. 1. Dr. Emmanuel Kamber of the Assyrian Human Rights Group brought up the point that Assyrians are the original inhabitants of today's Iraq. He explained that the constitution of present-day Iraq refers to Assyrians as a Christian sect or Syriac-speaking people and not as an official ethnic group. Dr. Kambar commented that "Assyrians deserve special attention because they are the most oppressed group of people in Iraq, for they share the suffering of other Iraqis and also face special oppression because they are Christian." 2. Dr. al-Khafaji explained that the government of a future free Iraq should feature a two chamber parliament so that Iraqi minorities, including the Assyrians, not large enough to be considered second nationalities, could still be represented in the Iraqi government. 3. According to KurdishMedia.com, an Assyrian man in the audience later spoke, addressing his statement to the Kurdish faction present at the conference, and stated that people must remember that one reason that Kurds are the majority is because they massacred Assyrians in the past. Many Assyrians in the audience nodded in agreement. While all seemed eager to continue the heated debate on this topic, the moderator, again citing time concerns, made it a point to move on and took another question in Arabic from a man asking about the relationship between religion and state in a future Iraq. (ZNDA: Phoenix) The state of Arizona, and the city of Phoenix in particular, are home to the fastest growing Assyrian community in the United States. With two Assyrian churches - Assyrian Church of the East and the Chaldean Catholic Church - it was only a matter of time before a social and cultural organization was to be established in the Valley of the Sun. Earlier this month 52 paid members of the Assyrian American Association of Arizona elected a new Executive Board to help them in promoting education, social, benevolent, and athletic activities within the Assyrian community of Arizona. 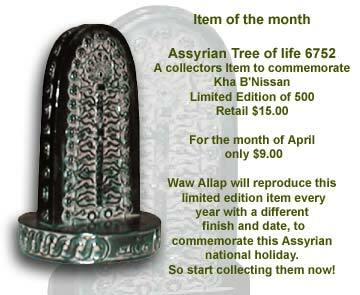 To Preserve our Assyrian Heritage and Cultural, and Share our Cultural with the Community at Large. To Promote Civic Interest within the Community. To Provide Communication Through Various Media for the Identification of the Assyrian People. To promote and Teach the Assyrian Language and History. The AAA of Arizona is a member of the Assyrian American National Federation and lists a soccer tournament, Assyrian language classes, and the purchse of a clubhouse as its long-term goals. It already prides itself in having formed a soccer team. If you live in Arizona and wish to learn more about the AAA of Arizona you may contact the Youkie Khaninia at (480) 963-2121 or Hendry Nadirsha (602) 485-4562. You may also write to shotapota_az@truefriends.com. (ZNDA: Wellington) United Nations World Refugee Day was celebrated last week at the New Zealand Parliament by refugees to New Zealand, migrant groups and politicians. Assyrians were among the refugees who performed music, dance, art and poetry. Peter Cotton of the Refugee and Migrant Service said the day also celebrated the contribution former refugees made to New Zealand. (ZNDA: Sydney) Earlier this month, the Australian Securities and Investments Commission (ASIC) obtained orders in the New South Wales Supreme Court requiring Jessie George, a man who advised unsuspecting investors to put their money into a scheme engineered by former Froggy boss Karl Sulema, to hand over his passport. George was allegedly involved in the operation of an unregistered investment scheme conducted by Karl Suleman Enterprises Pty Ltd, ASIC said in a statement. "Mr George's involvement allegedly includes advising people to invest in the scheme, arranging finance for investors and receiving funds from investors, including cash," the statement said. ASIC obtained the order after learning George had returned to Australia from overseas. Creditors, mostly Assyrian, claim they have lost $60 million in the failed investment scheme. OH NO, NOT SARGON ! Kurds, should not be allowed to voice their opinion in Zinda Magazine. I never knew you were so blind and so bias until this issue. I used to enjoy reading your magazine, but unfortunately you have become blind just like our other so-called news magazine, ironically called "AINA". It's more like blind AINA. I would appreciate it if the author of such article would identify himself. He has definitely put your website to shame. The content of your recent Weekly Poll has really surprised me. It reminded me a comment from one of my Iranian professors when I was a graduate student in Iran in the late 1980s. My professors once told me that it looks like you Assyrians by default assume that you must be enslaved by others. And that you only are giving yourself the choice of picking your masters and your oppressors. The designer of your poll strikingly shows this mentality in my opinion. The Assyrians (AKA Chaldeans) in Iraq will only enjoy greater human and political rights if the future administration of Iraq become a pluralistic and federal administration in which Assyrians have their own share of political power. And in which Assyrians will administer their own affairs in demographically (and perhaps historically) Assyrian areas and towns in Northern Iraq. They must be given the opportunity to administer their own affairs. That is the only way to guarantee Assyrian rights in Iraq! We might one day be a free people if we set our standards and goals higher! I have a question for Zinda. I was wondering if you notified the major news organizations, such as CNN & MSNBC, about what Iraq wants to do with flooding of the city of Ashur and if not why not? I love the new look! Keep up the good work; I look forward to each and every issue of Zinda. I will say that I am looking forward to the Northern Watch section. This is our homeland and detailed news from that region will be highly appreciated. As always, thank you so much for all the hard work in providing us a great source of Assyrian news and information. I enjoyed thoroughly the very attractive and captivating new-look of ZINDA. I very much like the separate features and calendar. Northern Watch and Archives transform Zinda into a very dynamic and rich magazine. If I could suggest something, I would only say that with your "Weekly Poll", try to make them more attractive by at least adding a final option to each poll under the heading, say: "Other (please specify)". Finally, please but please DON'T - in any form or way - add to the already saturated world of 'Assyrians non-tolerance of fellow Assyrians', by publishing articles (whether your own or readers) depicting other Assyrian organisations as bad and failures. Zinda's new look is fabulous! Now, for the nitty gritty- Can we get some opinions from the readers, not only to vote on Assyrians being divided in Iraq (and elsewhere) but to give some ideas toward solutions to this problem? We need to rise above those that undermine us, and stay focused on the goal--no matter what! Every time someone starts to feel "personal" for being Assyrian/Chaldean, they should remember that this personal part is just a piece of the whole. If we remain as pieces, we will always be like a puzzle in a box, instead of a whole picture or idea! So, everyone come out of the box and come together, for all our sakes. Congratulation for all the hard and dedicated work provided in serving the Assyrian Chaldean nation. I would like to see a new tool button added so we can correct our spelling while editing a reply message back to you, because I do copy and paste from Microsoft word and replied back to you and doesn't look good. Just a thought, probably it is there. I don't know! I read this article from URL address below about the assassination of the Assyrian leader in Kurdistan, Mr. Franso Hariri. Please allow our beloved readers to look at this valuable news. It shows Mr. President Bush concern about north of Iraq. The Assyrian Committee for Civic Responsibility is hosting a reception for Mr. Jesse White, the Secretary of State of Illinois. The reception will be held on Sunday, June 30, 2002 at 6:00 p.m. in the Assyrian National Council Building, located at 2450 W. Peterson. Donation: $25.00 per person. Hors d'ourves, wine, coffee/tea and sweet table will be served. For more information, please contact, Joseph Tamraz (773) 383-9600 or Nadia E. Joseph (773) 461-6633. Jesse White is the 37th Secretary of State for the State of Illinois. He was elected to the post on November 3, 1998, by a margin of more than 450,000 votes. Jesse White is the first African-American to serve as Illinois Secretary of State. As Secretary of State, White provides direct service to more Illinois citizens than any other public agency. The office issues state identifcation cards, vehicle license plates and titles, registers corporations, enforces the Illinois Securities Act, administers the Organ Donor Program,and, licenses drivers and maintains driver records. As State Librarian, Secretary White oversees the State Library and literacy programs, and as State Archivist, he maintains records of legal or historic value. Prior to his election as Secretary of State, White served as Cook County Recorder of Deeds -- a job he was first elected to in 1992 and re-elected in 1996. Prior to his election as recorder, Jesse White served 16 years in the Illinois General Assembly, representing the most culturally, economically and racially diverse district in Illinois. In 1959, White founded the internationally known Jesse White Tumbling Team to serve as a positive alternative for children residing in Chicago's Cabrini-Green and Henry Horner public housing communities. Since its inception, more than 6,700 young men and women have performed with the team. White has spent 40 years working as a volunteer with the team to help kids stay away from gangs, drugs, alcohol and smoking, and to help set at-risk youth on the path to success. The program has received international praise. He served our country as a paratrooper in the United States' 101st Airborne Division and as a member of the Illinois National Guard. Jesse White played professional baseball with the Chicago Cubs organization, which was followed by a 33-year career with the Chicago public school system as a teacher and administrator. Jesse White earned his Bachelor of Science degree in 1957 from Alabama State College (now Alabama State University), where he was a two-sport star earning all-conference honors in baseball and basketball. In May 1995, White was inducted into the Southwestern Athletic Conference Hall of Fame. He was an all-city baseball and basketball star at Chicago's Waller High School (now Lincoln Park Academy) and was inducted into the Chicago Public League Basketball Coaches Association Hall of Fame in June 1995. In 1999, he was inducted into the Alabama State University Sports Hall of Fame. Born in Alton, Illinois in 1934, he now lives on Chicago's near-north side. A scientific conference was held this month in the Assyrian village of Upper Dvin, dedicated to the life and activities of one of the greatest ancient Greek philosopher, Porphyry 'or Malkha or Malchus' (232-305 B.C.) who had Assyrian origins, and the famous Armenian philosopher, David Anhaght. The conference commemorated the 1740th anniversary of Parphyry and the 1520th anniversary of David Anhaght. Porphyry was the pupil of the ancient greek philosopher Plotinus. He is famous as a revenuer of Aristotle and Plotin's work. He also classified the work of his teacher and enlightened the life and activity of Plotin. The armenian philosopher, David Anhaght, translated all the works of Porpyry. The conference was organized by Armenian-Russian-Assyrian Cultural Center of Arbil. This scientific cultural Center was established by Pavel Khnoev in Upper Dvin's Secondary School in 1995. The only and the main object of the Center is to inform the Assyrians, especially the youth, about the greatest sons of the Assyrian nation. Mr. Pavel Khnoev of the Assyrian Cultural Centre opened the conference, greeted the guests, and then presented the purpose of the conference. He explained that "we need such meetings as they bring closer our two nations and give us an opportunity to learn more about our greatest Assyrians in history who made significant contributions in the world culture." In the previous conferences of the ACC of Arbil the life and activity of other Assyrian scientists and writers were discussed also. Mr. A. Stepanyan greeted the guests and Dr. M. Danielyan spoke about the life and the importance of David Anhaght's work. Dr. K. Mirumyan presented the life and philosophical contribution of another Porphyry Malkha. While Porphyry was known as a Greek philosopher and his works was written in Greek, he was indeed Assyrian. Mr. Sen Arevshatyan of the Matenadaran Museum spoke about the 'friendship' between the two nations of Assyria and Armenia and about the Assyrian history and culture. Matenadaran Museum houses over 12,500 Armenian manuscripts and the work of many Armenian writers, poets, historians of the 5th through 18th centuries A.D. . 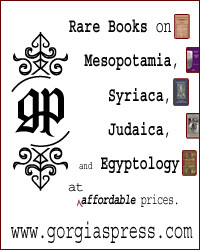 It also includes the translation and original works of many Assyrian and Greek authors. Later the Governor of the Ararat Region, Mr. Alik Sargsyan, greeted the participants and spoke about the good relations between the Armenians and Assyrians. He also announced that the Administration of the Region would do its best to improve the life of the Assyrian-Armenians. The participants were also greeted by the President of the Assyrian Association, Mr. Arsen Mikhaylov, and the Assistant to the Governor, Mr. Albert Yakhoubov. After the conference a concert was organized by the youth of the Village and many Assyrian songs were performed. 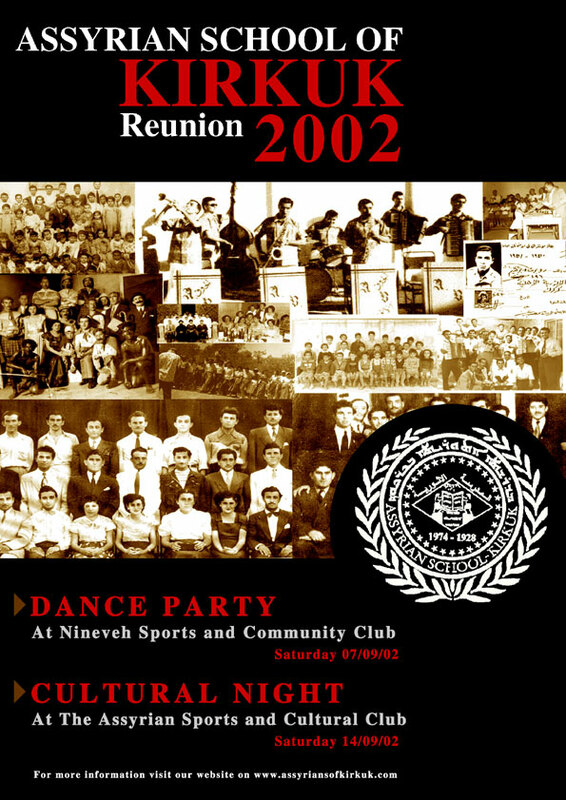 The Assyrian School Kirkuk Reunion Committee wishes to invite you to the Fourth Reunion to be held between September 6th to September 15th, 2002 in Sydney, Australia, as per attached Program. Following the success of the previous reunions held in Illinois, USA, and the third reunion/(one) that was held in Canada, we took upon ourselves to organize the Fourth/(4th) Reunion in order to honor those who contributed towards building, managing, maintaining and administering the school. Now it is time for us, the post-graduates of the school to pay back to those teachers who helped us to reach our endeavors. The main aim/(object) of these reunions has been raising funds for our needy brothers and sisters back home, as well as to fulfill our ultimate goal of rebuilding the Assyrian School of Kirkuk when time permits. We hope that you will be able to attend this memorable event in order to keep the dream alive. Informal gathering at Nineveh Club to meet friends and relatives enjoy a drink or two in preparation for 4th Reunion. The dance party will feature various famous Assyrian Singers and Entertainers. The evening will also feature a short drama, followed by Awards presentation to overseas guests and ASK volunteers and teachers and athletes. The ASK picnic will be merged in the Shara as it celebrated on this day where thousands of people attend the picnic ground. Music, Games and other activities will be organised for this occasion. Enjoy this fascinating river cruise, which begins from the historic city of Parramatta and travels through the Magnificent Sydney Harbour enjoying the views of the Harbour Bridge and Opera House. A cultural evening has been organised at the Assyrian Sports and Cultural Club to pay tribute to Assyrian School Volunteers and teachers. The evening will feature Assyrian Folk Music and various Assyrian Singers will perform at the gathering. Another historical day for Assyrians of Australia, Shara D'Mar Zaia attracts thousands of people to the picnic at Wallacia. The ASK 4th Reunion will officially be closed at the end of the picnic. A visit to the newly built St. Hurmizd Assyrian School a reminder of the ASK when it was established. Church Services are available at all Assyrian Churches on Sundays. With roughly 85,000 speakers left, Pennsylvania German, featured in the hit 1985 film Witness, is on the wane, as are most Native American languages. Also in danger: Gullah, spoken by descendants of former slaves, mostly on the islands off South Carolina and Georgia. Modern Aramaic (400,000 speakers) is a descendant of Aramaic, thought to have been Jesus' native tongue. Found in the Talmud, it was the main spoken language of Galilee in the 1st centuries B.C. and A.D. Many are trying to save the southern Chinese Nushu, perhaps the world's only language just for women. Often written on silk screens, one of its popular sayings is "Beside a well, one does not thirst. Beside a sister, one does not despair." Among the 300 tongues of Lowland Amazonia are Oro Win (three speakers) and Piraha (300), which has a sound like kids imitating motors and has the fewest consonants (eight) and vowels (three) discovered in a language. Faeroese (50,000 speakers) doesn't get protected by the European Union minority-language bureau: the Faeroe Islands don't belong. Others at risk are Sardinian, from the Italian island of Sardinia, and Yiddish, on the wane since World War II. The country's Aboriginal languages, such as the tribal Queensland tongues Wanyi, Wakka Wakka and Kullilli, are dying fast--at an estimated rate of one every three years. On 15 June, during the Jubilee celebrations for Queen Elizabeth's, by the "Order of the British Empire" 2002 individuals received honors for their service to the citizens of the United Kingdom. Among these was Mr. Andrious Mama for his "services to the Assyrian community and to race relations". The announcement was printed in the Times of London. The Elamite king, Huban-Nukash leads his armies against the Assyrians. King Sargon II (721-705) captures their commanders and 7,520 Elamite soldiers, as well as 12,062 of the local inhabitants and livestock. The Chinese emperor, Wu Tsung, promulgates an act of proscription against Christians and Buddhists in his land. He demolishes 4,600 monasteries and kills 2,000 Nestorian clergy and worshippers. The survivors were forced to return to Mesopotamia. Chrisitanity in China declined greatly as a result. 3. England, France, Belgium, Holland and Switzerland.